Where is the HB-12 Finisher Power Cord? What kind of fabric can I print on using the BT-12? Why do I need to smooth out wrinkles? How can tell when its time to replace the waste ink collector unit? This guide contains recommended settings to get the best print results and wash durability when using the VersaSTUDIO BT-12 and HB-12 finisher oven. This zip file contains the printer driver for the BT-12, Roland Design Software installer, and manuals for the BT-12. Download and extract the contents. Go to the macOS folder for the driver and UTILITY folder for the design software. This zip file contains the printer driver for the BT-12 and Roland Design Software installer. Download and extract the contents of the zip file. Click on the Setup Application to start the process. This document describes all the required consumables that are used on the BT-12. Note: A brand new BT-12 will include these items. Safety Data Sheet for Roland TPG garment inks used in the BT-12. Roland is excited to introduce the new VersaSTUDIO BT-12, Direct to Garment printer. 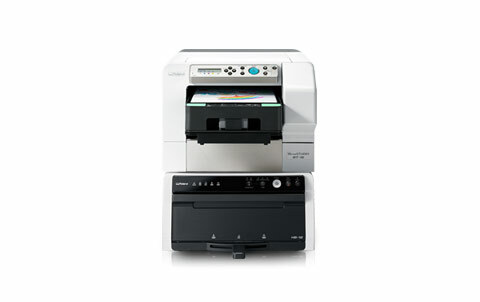 The BT-12 is an ideal entry level, compact device, for users who have little to no printing experience. Can I load the Roland Design Software on a Mac or PC? Whats the difference between Pre-Press and Pre-Treatment? Can I print on dark or black t-shirts? Do I have to use the included Roland Design Software to design and print my graphics? Can I do anything to the images, so the printed colors will come out richer and brighter? What is the recommended image file size? My computer doesn’t have a CD-ROM drive. How does the BT-12 detect the height of the material? ​To avoid any print quality or environmental issues please read these recommendations. Can I use the BT-12 with a wireless network? ​What other supplies would be handy to have when I start using the BT-12? ​What other items do I need at the time of installation? What is the recommended Maintenance Schedule for the BT-12? ​Looking for information about the maintenance schedule. Why do some printed T-shirts look better than others when using the same image and print mode? ​Looking into achieving consistent print quality from one shirt to the next. Do I need to do anything to the fabric to get the best print? ​Is there any suggested best practices for optimal printing results? Can I print on polyester fabrics? ​The HB-12 door is locked and I was told the power cord is inside the finisher. Do not power on the unit with a secondary cord. ​Will there be an issue if the garment has wrinkles in it? ​I'm seeing a near-end errror on the panel display. My printer is still working though.